Everyone enjoys receiving presents! Of course, we enjoy giving them as well, but not many can deny that receiving a surprise is really awesome. 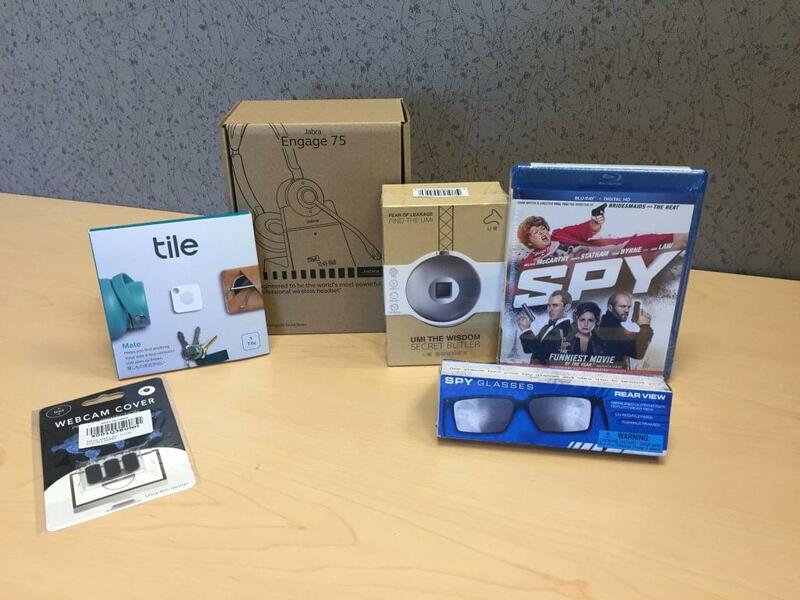 So, when a mysterious package arrived for me at the GetVoIP office, I was a bit giddy with excitement and curiosity. 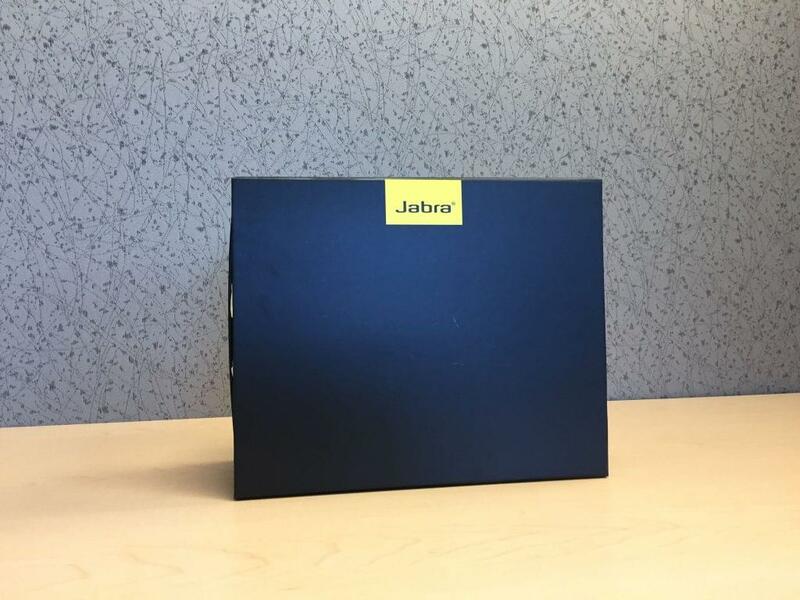 As it turns out, Jabra had worked with the team to send this covert package my way without me even knowing, and to say I was really pleasantly surprised was an understatement. Among some extra little gifts was Jabra’s latest holy grail, their new Jabra Engage 75 Stereo Headset. Turns out, Jabra was really curious to see what I thought about their latest headset, and I was really excited to give it a try. Everyone enjoys receiving presents! Of course, we enjoy giving them as well, but not many can deny that receiving a surprise is really awesome. 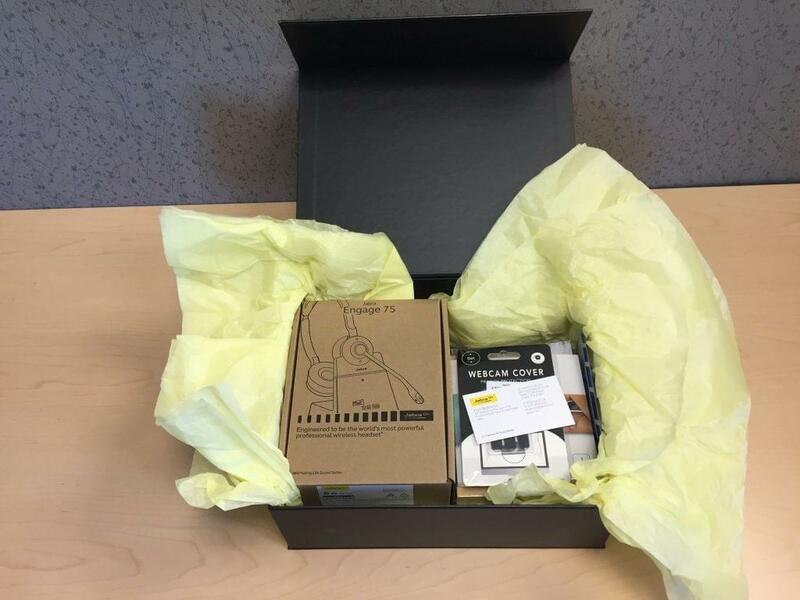 So, when Jabra sent this package my way without me even knowing, I was really pleasantly surprised. Of course the first thing that greeted me, after the UPS box that is, was a fairly basic package from Jabra — I already like the minimalism. Just a solid black box, with one neat Jabra logo. Right to the point. Right away there was a theme that stuck out, even before I read Jabra’s included notes. The Jabra Engage 75 would be the perfect headset for a spy. Dubbed as the “world’s most secure headset” by Jabra, this device packs some powerful encryption to keep intruders out. And to follow suit, of course, the package contained the rest of my new spy kit, what with a super secret fingerprint USB flash drive, webcam covers, and of course spy glasses. But in reality, the main focus here is the Engage 75 headset. 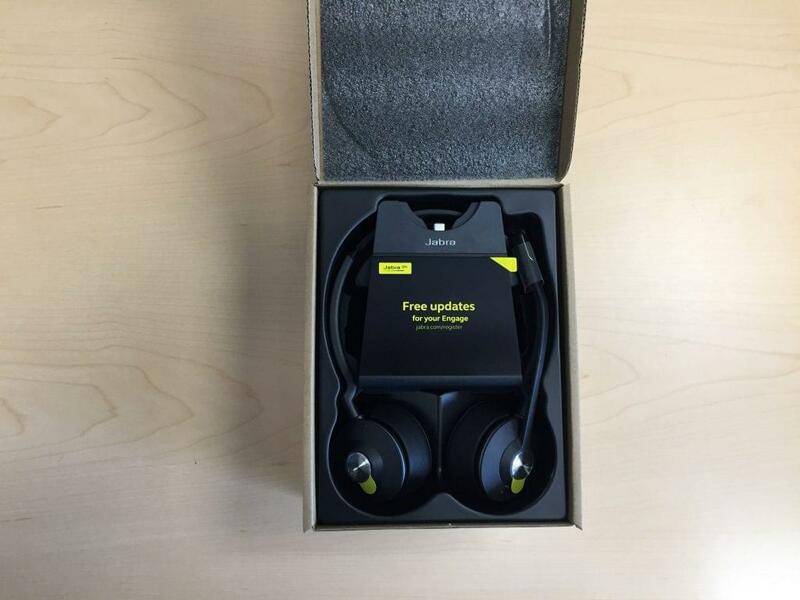 Jabra sent over this package so we can take a look at their latest flagship headset, and offer our honest take. Unpacking the Engage 75 Stereo Headset isn’t the most ceremonious experience, but it is absolutely pragmatic and well designed. Some of us love fancy and complicated packaging, but I prefer a simple experience — minimalism and simplicity. 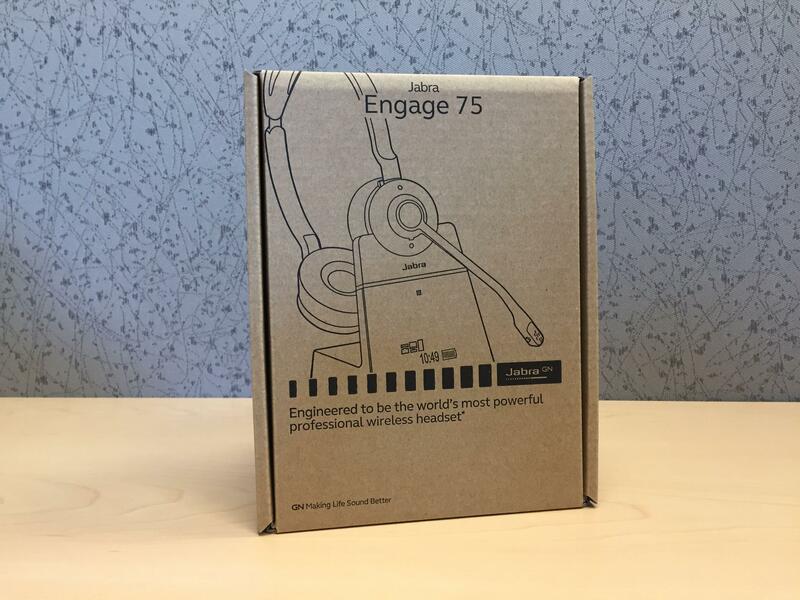 The Engage 75’s packaging opens up to display just that, the headset right in front, wrapped around the base unit. Under t he base unit, and a divider, are all the cables necessary to hook up your Engage 75 headset and base unit. That’s it. Everything is presented cleanly, is easy to open, and easy to access. Overall, setting up the headset was super easy. Simply plug the base unit into the wall, plug into the IP desk phone or related device you want to use, confirm on the on screen options, and away you go. Bluetooth connectivity was super simple as well, and had zero hiccups. Just preform the standard Bluetooth pairing process and calls will start coming in. We didn’t attempt to connect the Egange 75 with any softphones, but there shouldn’t be any issue when using popular softphone options like Bria and ZoiPer. There is a lot going on with Jabra’s Engage 75, and of course there would be — it is their top of the line offering after all. But there is really one key point that Jabra really wants to highlight, and that is a major focus placed on security. With 256-bit encryption, physical assisted pairing, and much more, Jabra has set the stage for a fairly unique and powerful headset. Overall, these are some impressive specs. The effective 150m (490ft) operating range puts the Engage 75 a bit above standard, with most DECT headsets topping off around 300ft or so. 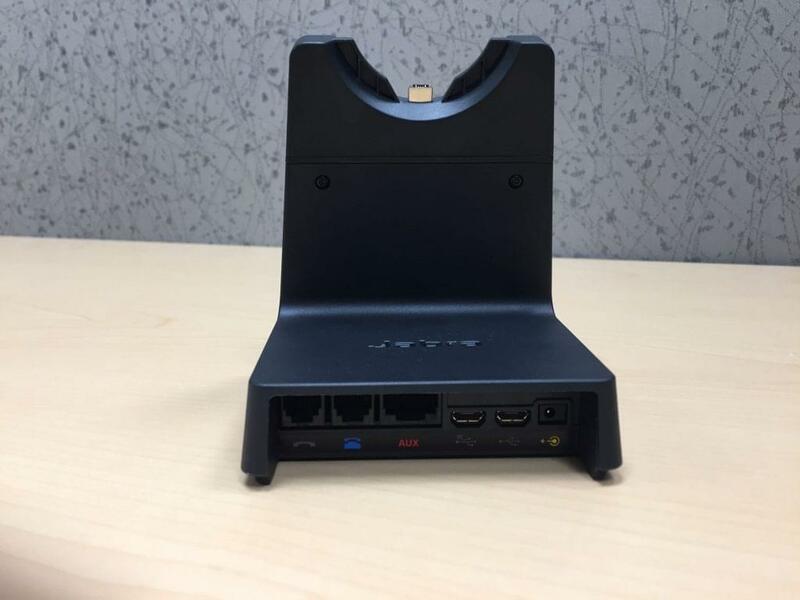 What is pretty cool about the Engage 75 is the ability to of course connect to an IP desk phone, but also the inclusion of two extra USB ports, softphone capabilities, and even Bluetooth connectivity with the ability to pair with two mobile devices simultaneously. Standard audio connectors are included as well, with RJ-9 and RJ-45 for various handsets, desk phones or speakerphones. The battery life was a pleasant surprise as well, with a reported talk time of 13hr, and standby time of 52hr. While we didn’t have a chance to fully test out the talk time, the headset hasn’t needed a second charge the entire time it has been with us. Speaking of which, the reported charge time of 90 minutes seems to be accurate, if not an overestimate. Our headset charged from roughly 20% up to 100% in under an hour. The headset itself was fairly impressive, as well. The entire device is clearly well assembled with a solid build quality. There are no noticeable seam marks in any of the plastics, no exposed or protruding screws or hardware, no gaps or seams in any of the panels. The headset itself is a bit more on the basic side, but for good reason. With tiny construction and minimal design, the Engage 75 headset is incredibly light, and easy to wear. The small, on the ear padded headphones are comfortable and easy to rotate or adjust for the right angle. There is an indicator light on both the microphone, as well one of the earphones, which will glow red when the user is currently in a call. I sat at my desk with the headset on for hours, and not once noticed any pressure or discomfort on my ears, normally associated with the “clamp” effect that comes from on the ear headphones, and barely even noticed it resting on top of my head since its so light. Being that this headset is a DECT connected device, it requires a physical base unit to pair with devices, as well as charge. The base unit itself is a really well designed device, too. The unit is again well constructed, with a very solid feel, and holds the headset surprisingly well, with only one earphone even making contact. 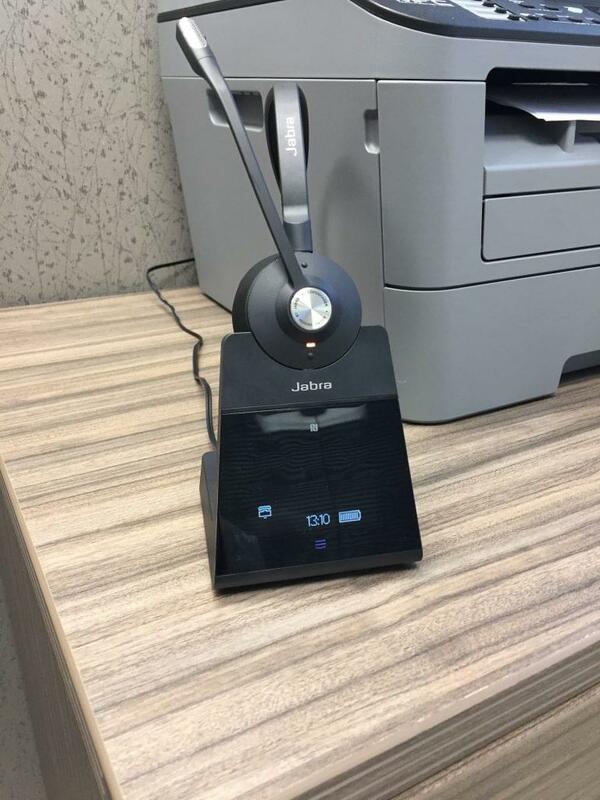 The bottom of the base unit has a soft foam pad to prevent any slipping on the desk, the back contains all the ports and connections mentioned above, and the front of the device simply displays a neat little Jabra logo, as well as the gloss black touch screen. The top of the base includes a USB B plug, where the headset itself can be docked for storage, as well as charging. What I really, really like about this connection is the absolute simplicity of grabbing the microphone off the base without any effort. Simply lift the headset up, and away it goes — no need to press any buttons, pull it at a certain angle, or apply a graceful touch. Just simply lift up the headset, and away it goes without any struggle or drama. This is great for those that really need to just grab the headset as quickly as possible. The only slight downside here is that placing the headset back on the base takes a slight effort, but really isn’t that difficult once you get used to it. The base of course does include digital call control buttons, with an answer, end call and volume control. The touch screen isn’t massive, and like other glossy surfaces tends to collect finger prints. However, the screen itself is easy to read, and responsive to touch controls. While I understand the desire to keep the size of the base unit itself down, a slightly larger screen would have been a big improvement — some lines of text wrap around and get cut off, making navigation a little confusing at times. But all in all, the base unit does what it is meant to do — serve as the central hub for connectivity, configuration, and charging. 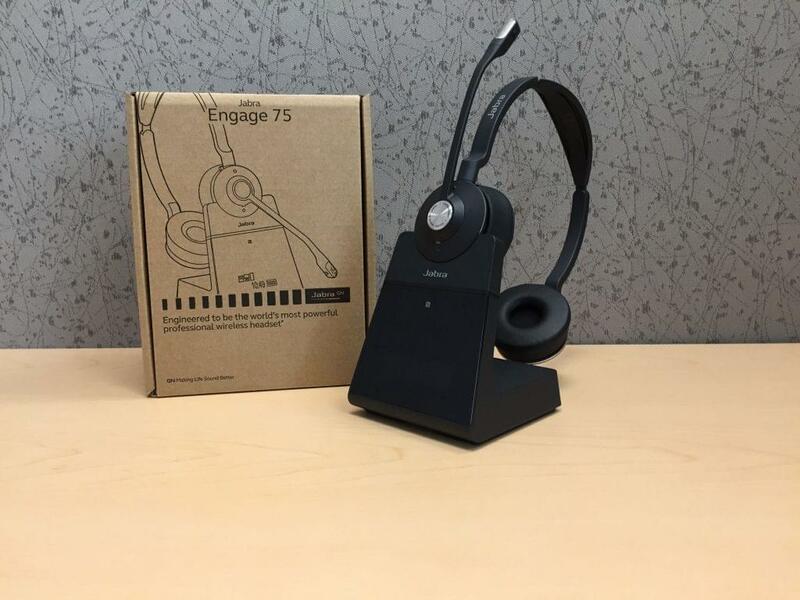 Now when Jabra sent over this nice package, they included a little run-down to highlight some of the main features and functions of the Engage 75. 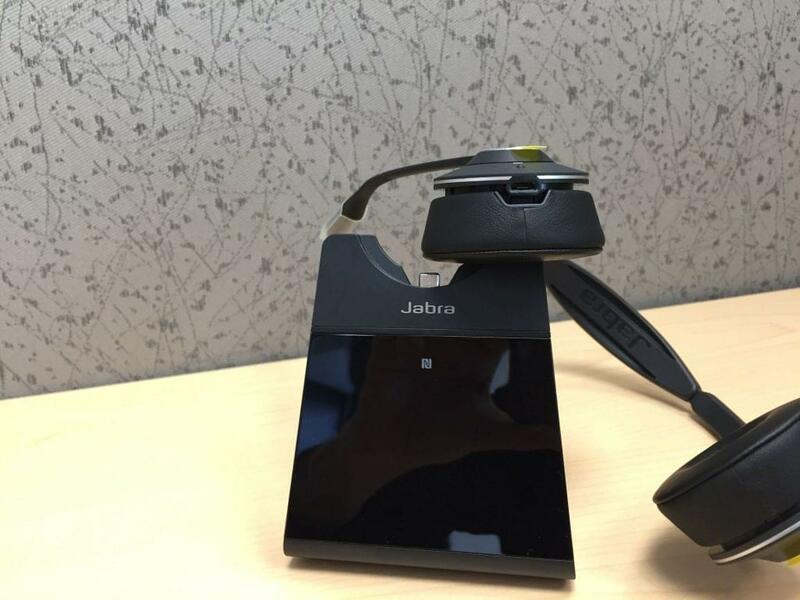 As I mentioned above, if there is one specific feature that really sticks out, it has to be the level of security Jabra built into this headset. Essentially this is an authentication feature, ensuring that only the proper user can actually use the base or headset, so that it can’t be compromised by any random passer-by, unlike more standard IoT devices which can act as a gateway into your network. The 256-bit Encryption is a bit unique, as well. DECT devices generally have some basic security built in no matter way, with the standard being 64-bit Encryption. Bluetooth can be seen as a slight security upgrade, jumping to 128-bit encryption, but lacks the range and consistency of DECT. 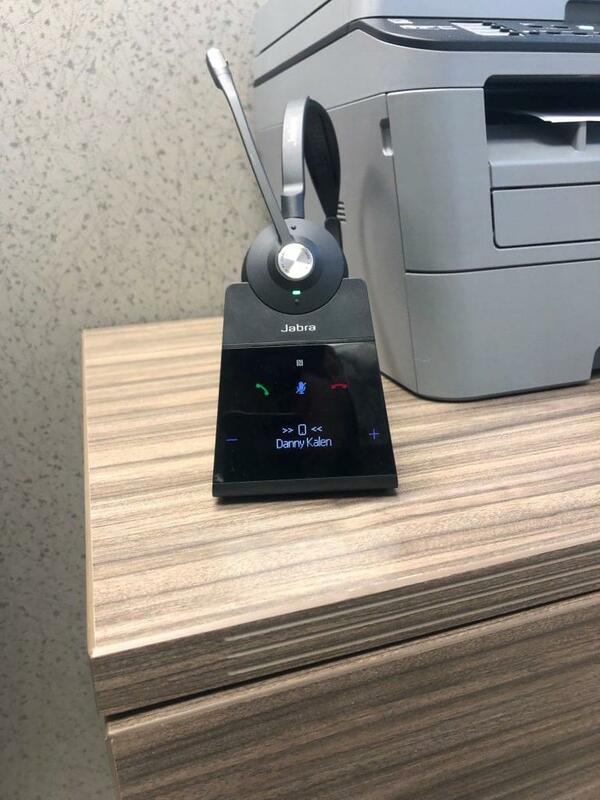 So what Jabra did was find the best of both worlds, and engineer their own DECT powered headset with built-in 256 bit encryption, while also managing to squeeze out an impressive range of 150 meters. Combine this with physical assisted pairing and other authentication factors, and you can begin to understand what makes the Engage 75 so secure. I was mainly impressed with the Jabra Engage 75. Now, it is worth noting again that we did not have a line-up of other headsets and devices to compare to. 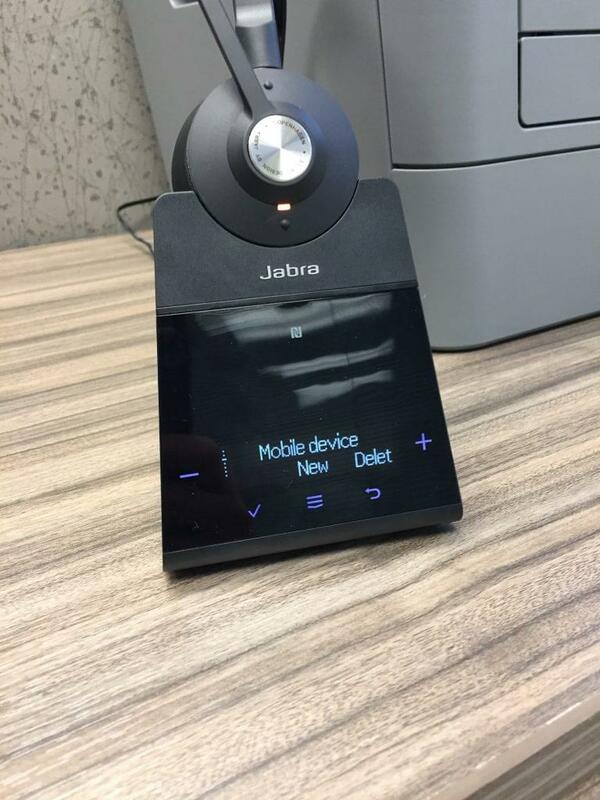 However, the Jabra has quite a bit going for it when compared on paper to other options. And while we have no had any direct competitors at the time of reviewing, we have had a chance to test out and handle multiple different headsets, headphones and microphones over time to establish a reference point. 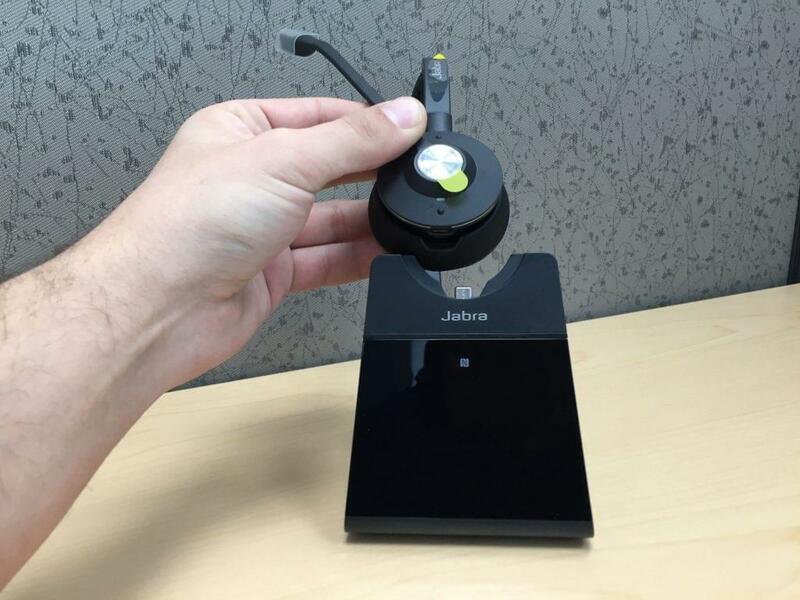 Jabra’s Engage 75 manages to hit a bit of a unique point, with that strong focus being placed heavy on securing the device, and its connections. This should really be noted as a massive benefit. I’ve written time and time again that everyone, especially businesses, should be taking security much more seriously, especially after things like ransomware are becoming so common. In this day and age with constantly connected devices, it is becoming easier and easier to find a way into your organization’s network. Protecting the network in anyway can save yourself from massive headaches, and potentially both time and money. However, looking beyond security, the Engage 75 manages to deliver on most fronts as well. This includes impressive connectivity options with two USB ports, as well as two simultaneous Bluetooth connections. The Engage’s range and battery life are both impressive as well, with further range and longer life than most competitors. 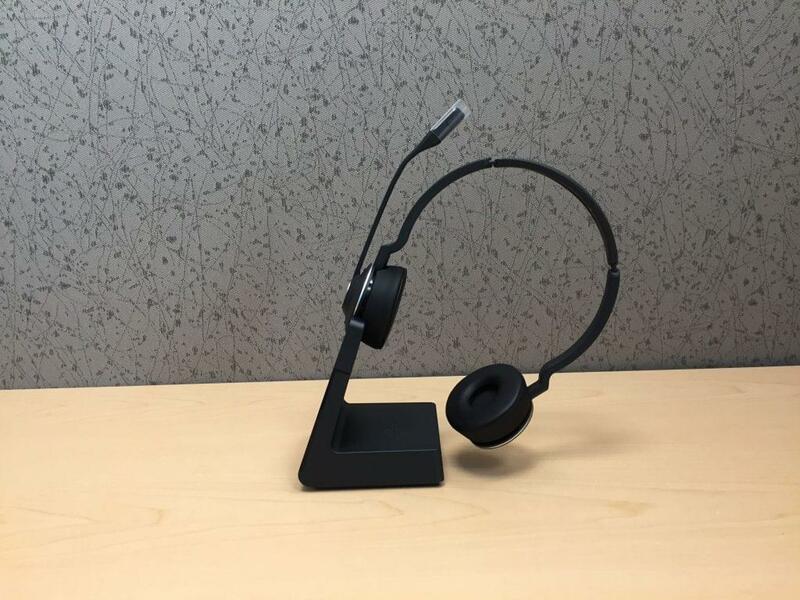 The headset will answer a call as soon as the user lifts the device off of the base unit. This makes it super easy to answer a call. The call will also end when the user places the headset back on the base unit, again making it easy to end a call and stay on task. The red indicator light on the headset earphone is bright and easy to notice, great touch to prevent interruptions. Ultimate Connectivity – The Engage 75 will pair with desk and mobile phones, includes two USB ports, an AUX port, and wireless capabilities. A strong focus on security puts the Engage 75 in a bit of a unique market. Security should be a concern for any business. The glossy touch screen tends to pick up fingerprints and attract dust easily. The touch screen could be a bit larger, or the text smaller. The current size forces the text to wrap to a second line in awkward moments, making navigation difficult at times. Placing the headset back on the base unit can be a little tricky, requiring some extra attention. Doing this wrong can result in the ear piece popping off. At the end of the day, the Jabra Engage 75 clearly fits the bill of a flagship headset. This impressive connectivity, unique security features, solid usability, and a great comfortable design, it absolutely stands as a strong choice. 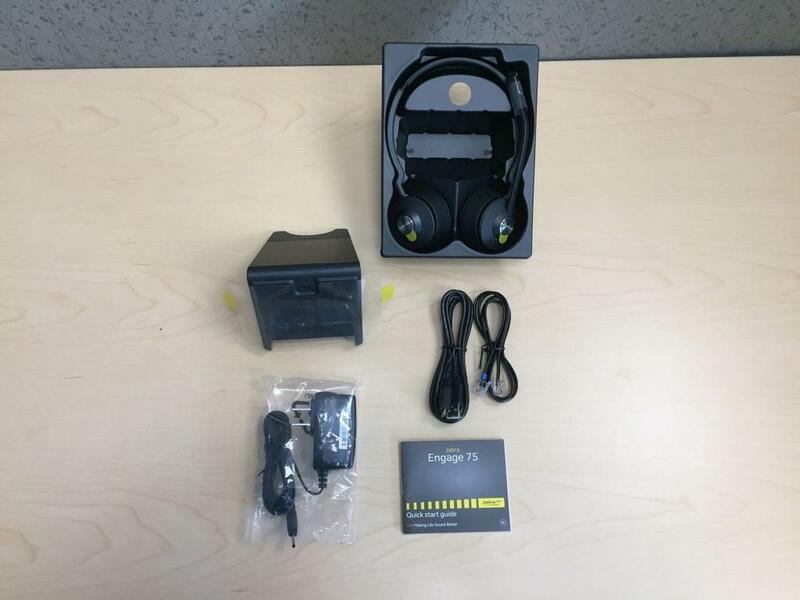 I of course want to extend a warm thank you to the folks at Jabra for sending this package over to us at GetVoIP. We’re always curious and itching to get our hands on the latest gear and tech to experience the latest developments and newest gadgets first hand. 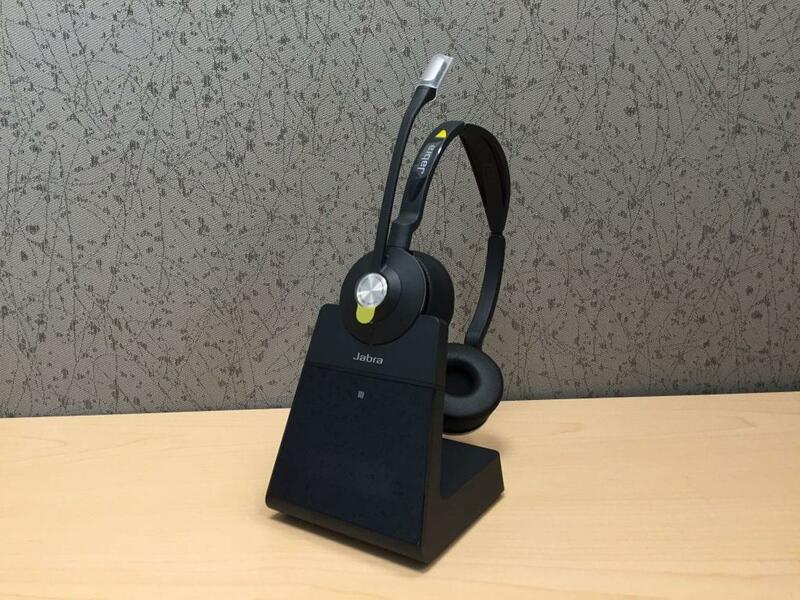 Without a doubt, Jabra’s newest Engage 75 Headset is an impressive piece of kit. When you consider the price, generally from $300-$440, it becomes much more important to take a close look at some competitor’s as well. However, if security is your main focus then this absolutely is a must have. Either way, your money will be well spent on the Jabra Engage 75 with great performance, and some nice bells and whistles.